As if creating one comedic masterpiece with 1938's BRINGING UP BABY was not enough, director Howard Hawks returned to the same genre a scant two years later - and he somehow managed to rival even his own previous masterwork. Nominally a reworking Ben Hecht and Charles MacArthur's play THE FRONT PAGE, HIS GIRL Friday manages to surpass it's classic source material and emerge as one of the screen's finest comedies. The film is also perhaps the perfect example of Hawks' trademarked rapid-fire, overlapping dialogue, which has never been as fast nor as furious anywhere else before or since. This is certainly one of the fastest moving comedies ever filmed, and the whole cast never misses a beat. Walter Burns, the conniving, self-serving newspaper editor, is a character that could have easily come off as a tyrannical jerk. As portrayed by the suave Cary Grant, however, the pompous, arrogant Burns actually becomes (gasp!) likable! It is a difficult balancing act that Grant must perform as teetering between the two extremes of the character, and he is arguably the only actor imaginable with the skill and charisma to pull such a tricky characterization off this successfully. And the one-and-only Rosalind Russell is every bit his match - full of verve and aplomb, Russell's Hildy is an independent career woman, brimming with intelligence and class, that impressively pre-dates the major feminist movement of the mid-sixties by a good 25 years. The film's supporting cast is no less impressive, with every single role cast to perfection. This is particularly true of Ralph Bellamy, who (along with his Oscar-nominated performance in 1937's THE AWFUL TRUTH) proves once again that he is the ultimate straight man. The film contains some grim subject matter that may seem like unlikely fodder for a screwball comedy (murder, attempted suicide, and public execution are all touched upon), although the film somehow manages to deal with such topics respectfully and without sacrificing any laughs. 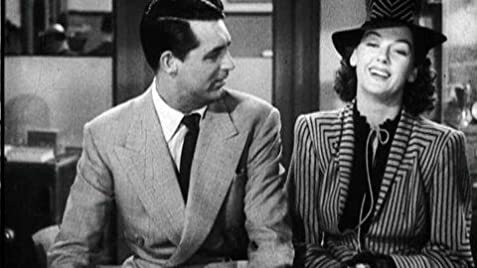 In the end, HIS GIRL Friday is an absolutely unbeatable romantic comedy that remains wildly hilarious and comes as close to sheer perfection as any motion picture could ever hope to. Right after Williams is found in the desk, the Mayor tells Walter that he's "Whistling in the dark. Well that isn't going to help you this time. You're through." Walter says "Listen the last man that said that to me was Archie Leach just a week before he cut his throat." Archie Leach was Cary Grant's birth name. Hildy Johnson: Walter, you're wonderful, in a loathsome sort of way. When Walter jumps up from spilling the drink in his lap, a napkin appears in his hand in the second camera shot. Opening credits are shown over a newspaper background.